Thanks to those who sent notes, facebook quips, and promises to buy some of these kinds of books. Indeed, the poor will be glad when those with resources commit to learn, study and work towards a more justice way of life. Reading these kinds of books may be demanding for some, but, yet, I am convinced they can be richly rewarding, exciting, even, as we take newer risks into deeper discipleship. It is a privilege to be one of your booksellers and one of the places you look to for reviews of this kind of content. Glad we are in this together. So, one more to tell about, a really practical and inspiring “next step” in this journey of being vibrant people of faith who care about justice and responsible stewardship: The Advent Conspiracy: Can Christmas Still Change the World? by Rick McKinley, Chris Seay and Greg Holder (Zondervan; $12.99) is a book & study guide that is the best thing on this topic we have yet seen. Not since the rather obscure Whose Birthday Is It Anyway stuff (from the wonderful alternatives) has there been a powerful, relevant, Biblically-rooted, spiritually-based resource to help us navigate the crazy Christmas consumer-fest. And, wow, is this cool. Two years ago, these fellas–all pastors of what might be called edgy evangelical emergent congregations—started a very spiffy Advent Conspiracy website for sharing Bible studies and ideas and resources, mostly around a shared vision, a pledge of sorts, to conspire together to do four simple things, four things which would be ancient/future type disciplines designed to help folks focus on (how does one say this without sounding cliched or cheesy) “the true meaning of Christmas.” Well, there it is, said in all its cliched glory. Who, really, doesn’t want the true meaning of Christmas? It is a cliche, has been romantically sentimentalized and, nowadays, stupidly politicized by the Christian right (who are now busy boycotting stores that don’t say “Merry Christmas”) but, still, don’t most of us hunger for the real thing? Aren’t some of us—more women, then men, I’d bet—nearly queasy thinking about the stress of the upcoming season? And don’t we all know we have to do something to tone down the materialism? 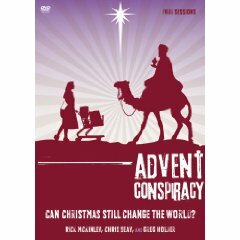 Now, there is a creatively presented Advent Conspiracy DVD ($19.99) and the brief but powerful book, which includes a small group discussion guide to be used with the DVD. Although any individual or family could do this alone–and you should, if you have to—it is best to cling together to a few other conspirators, a small group, a Bible study, a Sunday school class, a fellowship group. What would our congregations look like if everyone was invited to take the pledge? Worshiping fully we find what Calvin called “union with Christ.” Knowing grace we can (as Calvin Seerveld translates Luther) prance with joy. And give freely. Knowing we are loved, we pledge to love everyone, so we spend less on ourselves and give more to those with greater needs. Here is how they describe the four week curriculum. Worship Fully—Because Christmas begins and ends with Jesus. Spend Less—And free your resources for things that truly matter. Give More—Of your presence, your hands, your words, your time, your heart. Love All-–The poor, the forgotten, the marginalized, the sick, in ways that make a difference. This is a prophetic dream against the false religion of consumerism, as they baldly put it. And, they are not fooling around: they give strong warnings against the toxic power of ungodly consumerism. And, they are serious about giving. They’ve included a brief appendix of a few letters from fellow co-conspirators from the website, such as a church of 175 who have raised, $13,000 for clean water wells in Africa; one church in Cincinnati set a goal of raising $18,000 and they raised $72,000. Many churches are working with Living Water International to save lives by drilling wells, but other letters tell of congregants bringing in coats; another did baked goods at a local shelter. These testimonials are encouraging and exciting. Maybe if more of us “breathed together” and found motivation and accountability be being involved in a strategic plan like this, we really could give more. This is my first year in a parish, and I ran across the Advent Conspiracy website with very little time to prepare. The leadership pulled together, however, and we were able to present the call to live a more simple Christmas season all four Advent Sundays. On Christmas Day we held a single offering to be given to Christian Reformed World Relief Committee to purchase wells for communities that do not have access to clean drinking water ($250 buys one well.) Our church of 220 active members raised just over $50,000. God is good. I love how they frame this early in the book: they frame it not as a system, but a story. The Advent Conspiracy is not a four-point checklist for how to do Christmas. It is not a formula or a fool-proof system to make your Christmas more meaningful. The Advent Conspiracy is the story of the wondrous moment when God entered our world to make things right. It is the greatest story every told, and it changes everything—including the way we celebrate Christmas. As you read this book, understand what you’re doing and why you’re doing it. This is not about anger, disgust, or guilt—it is about entering the story of Jesus more deeply with a desire to worship more fully. It is not enough to say no to the way Christmas is celebrated by many; we need to say yes to a different way of celebrating. Our dream is that as you read this book you will discover Christ and be transformed by entering his story. Hey, “the Christian Reformed World Relief Committee”? Right on. I’ll take a copy of the book and DVD.